In MMA, it is now common place to have fighters to switch stance throughout a fight. But is that a good strategy? 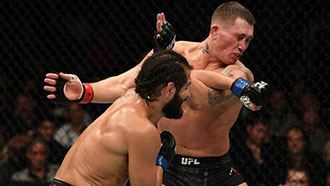 We just saw Jorge Masvidal knockout Darren Till with a shifting left hook in UFC Fight Night 147, so clearly it does work. And he is far from the first to use shifting effectively in MMA. Shifting is when you strike and step through, changing stance in the process. This opens up unique angles and can put a lot of weight behind the next attack. Jorge Masvidal from Southpaw throwing a 1,3 combo then a hook from conventional stance. As you can see above, it wasn’t just a mere shift in this case, as it was a combination of things. First, he switched to a southpaw stance from a conventional stance. The above sequence then starts consisting of 5 steps. The first step comes as he explodes off his left foot and throws the lead jab. The second step comes as he draws his right foot back. If you pay close attention, you will notice his hips and shoulders are leaning forward. This imbalance brings about step 3 from the left foot forward again as he throws the left hook. That punch is a heavy punch causing a shifting of his weight from the left foot to the right foot for step 4. The momentum of the punch brings his left foot in front in another shift for step 5, which allows him to throw another left hook, this time from the lead side to finish off Darren Till. As you can see, it isn’t as simple as it might appear at a glance. This was crafty footwork used to setup a powerful attack sequence. Southpaws are vulnerable to left hooks, so Jorge took full advantage of that and combined it with shifting to create unique angles that are hard to see. So fighting from both stances is always good then? Because of the laws of economics, you will have a hard time perfecting defense on both basic stances (southpaw and conventional). Even for someone who is a prodigy, they would be splitting valuable time on defensive skills that could be used to make one stance even better. I believe that all fighters should be familiar with fighting from both stances, but they should devote the majority of their time perfecting defense in one stance. I believe using shifting and switching stance occasionally to open up angles is a good use of strategy. Just like changing your striking rhythm, range, or target, when you do a good job of being unpredictable, it creates chaos in the enemy and makes you hard to game plan for. But I have seen fighters that stay in their “second” stance for too long and get hurt because their defense is not as sharp. So I would caution against prolonged stance switching. Of course every situation is different. But as a rule of thumb, I like switching stance for attack or counter opportunities, but not to defend from. I agree in general, but want to point out from experience that with practice your weaker side defense can become as strong or stronger than the former strong side. As a kick boxer in the 70″s and early 80’s, I injured my right hand and was out of commission for a couple of months. I padded the injured hand and worked the southpaw side exclusively and soon developed strong defense from that side. Marvin Haggard switched regularly as a boxer with no loss of defense. Also, it allow you to nullify an opponent’s strength. For instance if he outjabs you, switch to open position and the jab is not that effective, same for many other techniques.